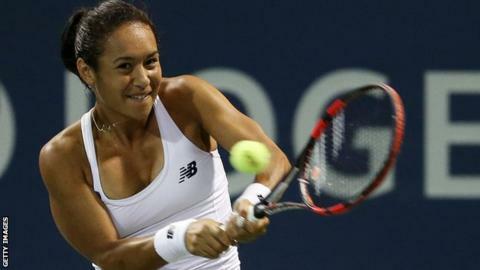 Heather Watson progressed to the second round of the Rogers Cup in Canada after beating American Irina Falconi. The British number one, 23, came through with ease to win 6-1 6-2. Fellow Briton and world number three Andy Murray was rained off at 4-4 against Spaniard Tommy Robredo in the second round - Wednesday's play resumes at 17:30 BST. There were wins for top seeds Novak Djokovic and Serena Williams, but Canadian Eugenie Bouchard went out. Bouchard, Wimbledon finalist in 2014, was beaten 6-0 5-7 6-2 by Swiss teenager Belinda Bencic in Toronto, which is hosting the women's event. The 21-time Grand Slam winner Williams, 33, beat Italian Flavia Pennetta 2-6, 6-3, 6-0 to reach the second round of the competition. In Montreal, where the men's tournament is taking place, Djokovic, 28, was making his first appearance since winning Wimbledon in July. The Serb claimed his 250th win at the Masters 1000 level with a 6-3 7-6 victory over Thomaz Bellucci of Brazil. The world number one will face either 14th seed Grigor Dimitrov of Bulgaria or American Jack Sock in the third round.